Senior Caitlyn Hudek continues to work on the grid for the mural. Every school year there is a class called senior art seminar. The small group is run by art teacher Fiona Rawson and consists of only seniors. Through the class, a small group of seniors get to make a mural that is put on one of the walls of the school. The walls of the school have been filled with tons of murals over the years since this class has started up. 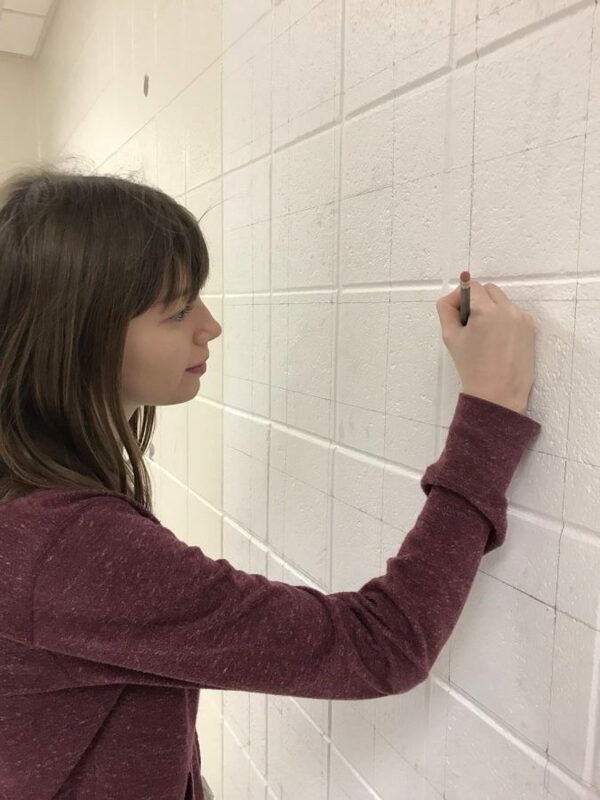 For this school year, seniors Jade Danhausen and Caitlyn Hudek are the only students in senior art seminar and have to work with each other to make one mural. They had to pick out a painting that they both liked and a place to put the mural in the school. The painting that they picked out is from Theodore Gericault who was a French painter that lived back in the eighteenth and nineteenth century. The spot had to be approved by Principal Patrick Adams, so once they got the approval, they were able to start painting. Right now, they have put primer on the spot and are now drawing out the grid so they can start sketching out the painting. The mural will take approximately three months and there will be a small gathering of Danhausen and Hudek’s friends and families for the unveiling of the mural when it is finally complete. “I’m very excited to start working on the mural and it’s fun to know that it’ll be there for years. Please don’t mess with wall or you can mess the mural up,” Hudek said.